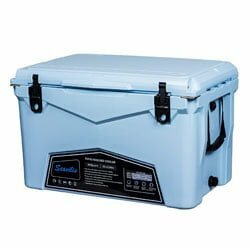 Patriot Cooler Reviews: Great Cooler at a Great Price! Ladies and gentlemen welcome to our Patriot cooler review. This is one of those reviews for me where I honestly do not know what I think for a while, and it takes some time for me to reach a verdict on whether what I’m looking at is a great product or not. Luckily, before I did this review, I had already gone through that process and made up my mind about the product. In this case, I’m going to jump the gun and tell you right off the bat that this is a great cooler at a great price. However, while there are a few drawbacks, they certainly aren’t insignificant and need to be pointed out. That is what I’ll be doing as I move along with the Patriot ice chest review. To begin with, Patriot is an “All-American” brand, at least according to their website. They deal in coolers, both hard and soft, and insulated drinkware, though we’ve only seen hard and soft coolers in their product offering so far. We noticed that they’re based out of Houston, Texas, which immediately led us to compare to other brands coming out of Texas, such as Frio, Kong, and Yeti. Patriot also happens to provide massive support for the veteran community. They not only give discounts to military personnel, but they also donate 20% of their profits to Homes for Our Troops. That already puts them ahead of a lot of other brands for their philanthropy, if for nothing else. The only other brands we know of that are heavily invested in helping out veterans are Taiga Coolers and Kong. It’s understandable that Patriot Coolers would name itself as it has, given its massive support for the men and women who have risked their lives for the country. That is, indeed, a patriotic venture. However, I couldn’t help but notice a little bit of irony in the fact that their coolers aren’t manufactured in the USA. On their website, they point out that their coolers are designed in Houston but manufactured in China. Quite the counterpoint to the claim to patriotism! It might not be a good thing for some consumers prefering American made coolers. As you may have guessed, the Patriot hard cooler is rotomolded, which immediately puts it right up there with the best of the best in terms of hard coolers. It also has a very rugged build that was clearly designed to take a beating. 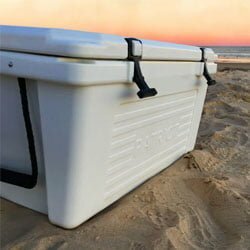 Some of the most rugged coolers we have reviewed have come out of Texas. I still remember how much fun we had reviewing Kong coolers with their extremely rugged build. I expected no less from Patriot, and sure enough, I got no less. This wonderful cooler is definitely built to last. The outer body is pretty strong, and the inner polyurethane insulation extends up to 3 inches. That’s a lot of insulation by anyone’s standards, and that is why the ice retention on this cooler is also great. Something I noticed during the review, and also something I’ve seen people mention on Amazon and other review sites is how heavy the cooler is. 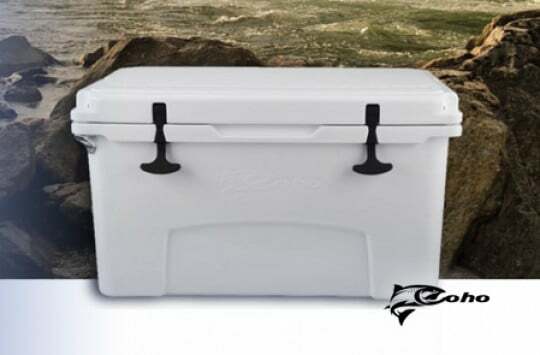 It’s heavier than your average cooler, especially when fully loaded with cargo and ice. I think part of the reason why this is so is the thick insulation. To make it worse, the cooler has no wheels, and the 20-quart version has a thin steel overhead handle that’s certainly going to be hard on your hands when you’re hauling such a heavy cooler around. That said, it also has useful side handles that make it easier to carry during those especially heavy times. Overall, the design of the Patriot cooler isn’t very unique. 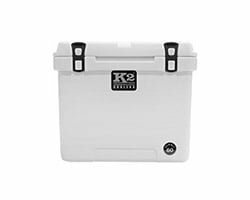 They decided to take the safe route and use the design that has come to be the hallmark of many premium coolers in the market, including Yeti. What am I talking about? I’m talking about the rectangular shape, the plain white color scheme, the rubber T-Rex latches, and the drain plug located in the side. 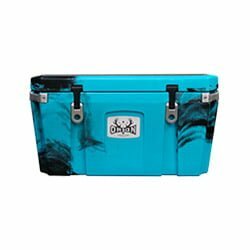 We have come to recognize this stereotypical cooler design in many premium coolers. It started with Yeti and then quickly spread as other cooler brands quickly copied the leader. On the one hand, the design certainly works. On the other hand, a brand is certainly not going to get any extra points for employing it. Let’s start with the handles because the unique heaviness of this cooler makes the design of the handles a very important thing to consider. For the 20 quart, there is the one overhead stainless steel handle. It is quite thin, which means carrying the cooler at full capacity is bound to hurt. 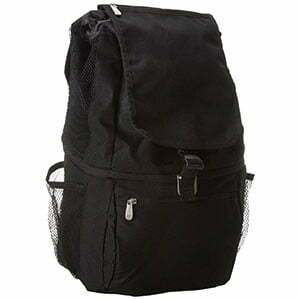 However, to make matters easier, there are the side handles which are made out of nylon rope. They make carrying the cooler very easy, though there will definitely be a fair amount of shifting of hands if you’re carrying it over a long distance. There are also two sturdy side handles for the 45-quart cooler, which are quite the boon for a cooler that is reputed to be as heavy as this one. This is something the Yeti tends to lack, which gives this cooler brand some points over Yeti. Side handles are quite underrated in the world of coolers. Only someone that has had to carry a super heavy cooler with the overhead handle would understand. Next in line are the latches. The strong rubber latches are T-Rex latches, just like what you would find on a Yeti, and the quality isn’t that much different. They’re pretty easy to use, coming off easily when you want to undo them and also fitting into their holdfasts very easily. However, despite the relative ease of operation, these latches hold on quite tightly, ensuring the lid stays tightly shut and helping with the insulation. Speaking of the lid, it has commercial-grade rubber gasket that’s guaranteed to keep the cold in and the heat out, further improving the insulation of your cooler. The hinges are also pretty strong, making sure the lid does snap off at the hinges, which can be quite vulnerable in some cooler models. 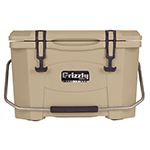 Together with the rugged cooler exterior walls, these lid and hinge features make this cooler bear proof. If a bear can’t pry it open then you know it’s tough for sure. On the inside, the insulation is pretty thick. I got the impression that it really ate into the space meant for the food and beverages, making the capacity a little smaller than advertised. I didn’t quite measure the capacity difference, so it’s more of a personal issue. 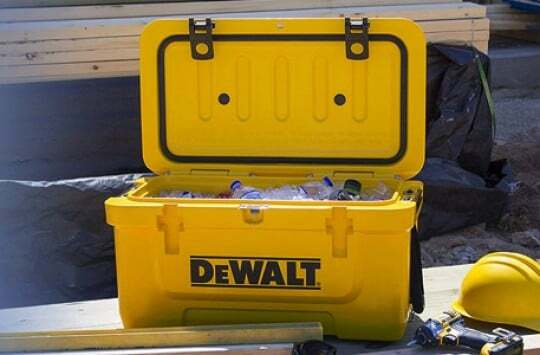 Perhaps you can try and measure for yourself if the capacity is reduced by the thick insulation, in case you decide to purchase this cooler and tell us what you found out in the comments. On the lid, there is a rule for fishers to measure their catch. It’s embossed into the plastic and highly accurate. On the 20-quart cooler, the ruler is 17 inches in length, while it is 24 inches in length on the 45-quart cooler. The bottom of the cooler features non-slip feet that hold it in place and prevent it from slipping about on a slippery or moving surface. The last thing you want is your cooler moving around in the bed of your pickup truck while you’re driving and mashing up the contents. On the side is the drainage plug, which is screwed on and off. It doesn’t come with a chain attached, so you better watch where you place it when you uncap it so as not to lose it. Apart from that, it is pretty good at draining the leftover water from the melted ice in a short span of time. The advertised time on the Patriot website is 5 days. Sure enough, we tested this and found it to be fairly accurate, dependent on the ambient temperature and how often you opened and closed the cooler. Also, you should add plenty of ice in it at the ratio of 2:1 for ice to the contents of the cooler. To maximize ice retention, you can also think about putting in some well-frozen ice packs. 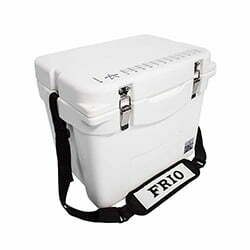 This cooler comes in only two sizes (the 20-quart and the 45-quart) and 4 colors (white, gray, tan, and aquamarine). This is one of its drawbacks. It doesn’t have enough variety in its offering to pose serious competition to industry mainstays like Yeti. However, if you’re not into fancy colors and don’t happen to have special needs that call for a very large cooler, it will work just fine for you. Patriot’s hard coolers come with a limited warranty of 5 years. Their soft coolers and drinkware come with a limited warranty of 1 year. This is a great adventure cooler. Based on the construction and features, it was obviously built to take a beating and offer simple utilities for the everyday adventurer, hiker, fisherman, and hunter. If that’s the kind of person you are, then it’s definitely worth checking out. However, it’s so versatile that you can also use it for a simple picnic or tailgater. 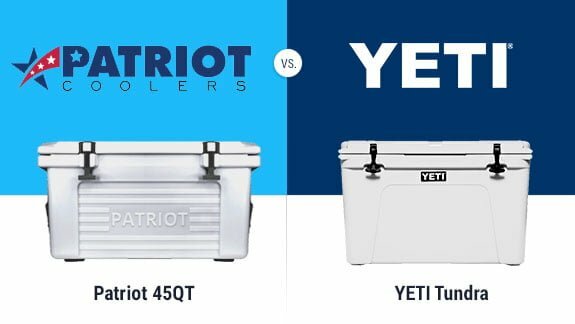 In this case, the nearest comparison would be between the Patriot hard coolers and the Yeti Tundra. To start with, both coolers are rotomolded, which makes them premium coolers guaranteed to offer high quality. 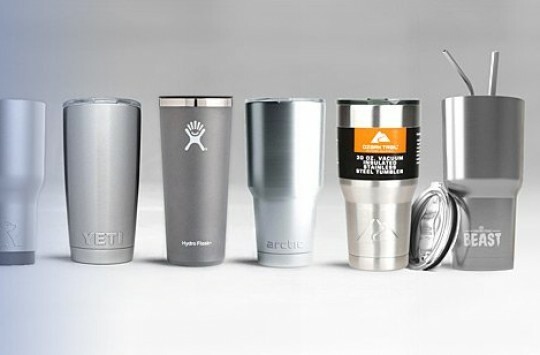 Yeti certainly has more available sizes and colors, which puts them ahead of Patriot in the variety sector. They also have more unique features, with the Patriot cooler feeling a little ripped off of Yeti. Yeti also has more customization options. On the other hand, the side handles on the Patriot are a convenience you won’t find on the Yeti. In terms of ice retention, the Yeti Tundra is ahead of the Patriot cooler but of course it depends on many factors, such as the temperature, how often the lid gets open, if the cooler is being kept in the shade or not and so on. For most intents and purposes, however, the ice retention of a Patriot cooler is good enough. It’s also worth mentioning that Patriot gives back to the community in a big way that Yeti doesn’t. This is an important factor for many, though Patriot’s coolers are manufactured in China, which is also an important factor to consider. Overall, Yeti is Yeti. It is an industry leader that has many die-hard fans. If you’re one of them, then stick to the industry leader. However, if your budget is a little restricting, and you don’t mind trying something new, Patriot is certainly worth considering. Frio Coolers is based out of Texas, just like Patriot. Their design is a little different and unique in its own way, especially with the latches and handles. We really loved those aspects of it while reviewing it. Kong is one of our favorite products to have ever reviewed by far, and that’s saying a lot, considering the dozens of brands we have already reviewed. 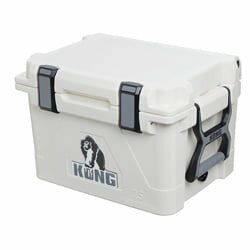 We loved their premise, we loved the unique design of their coolers, we loved how tough they were, and we also loved the business model employed by Kong, which involved owning their own factories, manufacturing locally, and cutting out expensive middlemen. When we reviewed Seavilis cooler, we loved the way it looked on the outside, with some pretty cool looking exteriors that were bound to turn heads. We also compared it to Yeti, pointing out what made it better or worse than the industry leader. 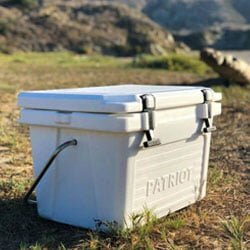 Patriot also happens to have a line of soft coolers you might be interested in. As it turns out, this is one of the things that I didn’t like about this particular brand. Its line of soft coolers isn’t especially unique and seems to basically be RTIC by a different name. Even the similarity in product names seems too close to be coincidental (RTIC SoftPak vs. Patriot SoftPack). There are 2 options for the Patriot SoftPack: the SoftPack Cooler 20 and the SoftPack Cooler 30. The sizes and overall design are quite similar to their counterparts from RTIC, which offers the same sizes. The soft coolers also bear an eerie resemblance to other brands like the Tourit and the Homitt. To be entirely fair, the soft cooler is great and performs like other soft coolers, like the RTIC SoftPak. However, the problem is that the entire line feels like a rip-off and doesn’t really offer anything new. In fact, that’s why we didn’t dedicate a larger section to the soft cooler review. In this respect, we expected more from Patriot Coolers, especially since they had a really good opportunity to differentiate themselves from the competition. However, for the average joe, the soft cooler is pretty okay. For a cooler geek, on the other hand, you might be a little disappointed. You can buy them at a variety of places, including the brand’s own website. However, we recommend that you buy your Patriot cooler on Amazon, as it’s one of the most trusted online marketplace in the world. Doing your shopping on Amazon brings with it a lot of benefits, including real reviews by other customers, buyer protection in case you don’t like the product, 1-day shipping and free shipping in some cases, and lots of other perks. And with that, our Patriot Cooler reviews come to an end. As you can see, this is a great cooler, but it isn’t the kind of cooler that gets etched into your memory. It certainly isn’t a Yeti or a Kong. Can it be? Maybe, with an overhaul of its design. For now, however, it will do well enough to try out. Get Lake Ready With Patriot Coolers! Best Insulated Baby Bottle Cooler Bags - Who Said Babies Can't Be Cool Too?